Ben Giese is a man of exceptional taste. As the creative director and editor-in-chief of the aesthetically superior motorcycle magazine, Meta, he has to be. But he’s also a rider, who grew up racing motocross. So when his 2017-model Triumph Scrambler went under the knife, both form and function vied for top spot. ?I wanted to transform it into a true ‘scrambler‘ that could take me well beyond the paved city streets of Denver, and deep into the mountains and deserts of the Southwest,? Ben tells us. ?The goal for the build was to be understated, refined and focused on performance.? Ben slogged away in his father’s garage for three cold winter months to build his ideal bike. The result is a highly focused scrambler, with a perfect stance and near-Scandinavian levels of minimalism. ?I am not a professional bike builder by any means,? he admits. ?I?m simply a graphic designer with a vision for what I want, and the tenacity to figure it out. Which means you can do it, too.? 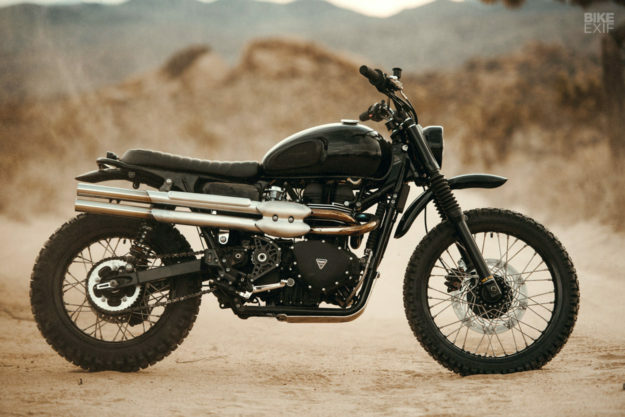 The list of mods on Ben’s Triumph reads like a blueprint for the definitive desert sled. Off-road performance has been cranked up more than just a notch, with Race Tech suspension components at both ends. The rear shocks are custom G3-S units, measuring 1? longer than stock, and the forks have been upgraded with Gold Valve cartridge emulators. Ben’s also fitted larger wheels, more suited to riding dirt. Woody’s Wheel Works in Denver laced up a set of 21F/18R Excel rims for him. They’re wrapped in Shinko SR244 dual sport tires. The motor’s been left alone, but Ben’s installed a few hop-up bits. There’s a complete air box removal kit from Triumph specialists British Customs, which includes a pair of K&N filters. That’s matched up to their rowdy ‘Shotgun’ exhaust system. There’s even an air injection removal kit from them too; a small mod that removes the stock emissions control, helping the exhaust run cooler and smoothing out the throttle at low revs. Frame mods include a 6? subframe trim, and a new rear loop for a vintage vibe. Ben’s also shaved off the passenger peg mounts, and added new turn signal tabs. The seat’s a custom unit, shipped over from Down & Out Motorcycles in the UK. Just behind it is a stubby rear fender, along with a Prism Motorcycles taillight on a hand-made mount. The front light’s a JVB-Moto number, painted black. Just below it is the stock fender, re-mounted on a British Customs high fender bracket. Ben’s hidden the OEM rectifier (which is usually awkwardly placed under the headlight), along with the horn. Up top are a set of vintage MX handlebars, paired with a set of Biltwell Renegade grips and a billet brake reservoir from British Customs. Ben’s swapped the bulky clocks out for a svelte dial from Motogadget, and mounted it just on top of the steering column, in front of the bars.